It is one of the key spices used in many countries such as India, Pakistan, Middle East, South East Asian to name a few. For thousands of years, Turmeric has been an essential element from enhancing many dishes such as curries and rice to boosting the color of cakes, mustards and even used in dying clothes. However, there is more to Turmeric than using it as a flavoring or coloring to a dish or dye. Places like India, Sri Lanka, and Asia for example, have long known for thousands of years that Turmeric has powerful healing properties as well. What is so special about Turmeric? The powder form of Turmeric (as we generally see in when purchased in stores/ markets) occurs by grinding the dried root of the (Curcuma Longa Plant). Within Turmeric are compounds, one of which is called Curcumin and has become an important factor is aiding many ailments. Turmeric has been in use for centuries by the Indian Ayurvedic healers amongst other older civilizations. Science is finding out more about the many healing benefits of Turmeric and its main compound Curcumin than ever before. Through research, Curcumin has shown to have very powerful anti-inflammatory properties along with being a powerful antioxidant. Now before you start adding extra turmeric to your foods there is one part that is important to know first about Curcumin even before learning about all those health benefits of Turmeric. When you blend Turmeric, Spices and Diatomaceous Earth your gut not only gets the benefits of iron which is great for preventing fatigue and tiredness not to mention its important with having good brain function and health. 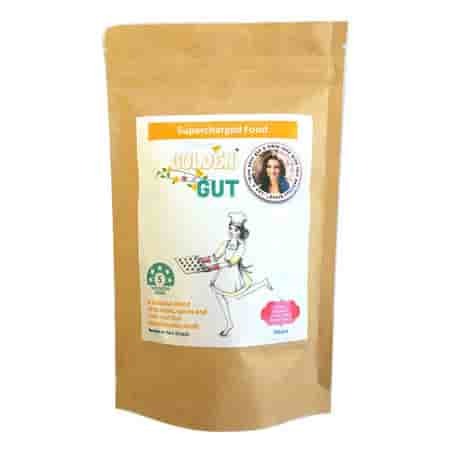 This golden gut powder which is organic by the way will help to give you a healthy pH function of 8 which assists in keeping that healthy alkaline balance needed within the body. Ok, let’s break down each in simple terms using vitamins as an example. Water Soluble vitamins are those that are not stored in the body. For example vitamin C along with all the vitamins B. When they are taken orally, they dissolve in water, which then heads toward the bloodstream. The body takes what it needs while the excess is excreted in the urine. This is why you will find when going to the bathroom your urine will be a different color mainly due to the excess vitamins the body is releasing. Just beware the change in color can also be other factors as well and not just excess vitamins. These can be your Vitamins A, D, E and K are normally stored in the body. When these vitamins are ingested, they dissolve in fat and these are stored in your liver. They do not need to be replaced each day as you would with the water-soluble ones. Below is the definition from Wikipedia. “In pharmacology, bioavailability (BA) is a subcategory of absorption and is the fraction of an administered dose of unchanged drug that reaches the systemic circulation, one of the principal pharmacokinetic properties of drugs. By definition, when a medication is administered intravenously, its bioavailability is 100%. However, when a medication is administered via other routes (such as orally), its bioavailability generallyTH[›] decreases (due to incomplete absorption and first-pass metabolism) or may vary from patient to patient. Bioavailability is one of the essential tools in pharmacokinetics, as bioavailability must be considered when calculating dosages for non-intravenous routes of administration. ingested dose that is absorbed”. This is about how much is able to be absorbed into the body. As it states above if it’s directly injected into the bloodstream is has 100% Bioavailability. If taken orally, then the percentage of Bioavailability will be lower depending on what has been taken. OK Back to Curcumin being Fat-Soluble and having Low Bioavailability. Curcumin is Fat-Soluble and as such is best when dissolved in Fats. If taken alone, for example, mixed with water or added to something with no fat, then most will go to the gastrointestinal tract and expelled shortly after it has been ingested. Some may end up getting into the bloodstream but most will be lost. This is why Curcumin has low bioavailability when not taken and ingested with fats. There are stages when taken orally that Curcumin needs to go through. Therefore, if fat is not included with Curcumin, as a fat-soluble it will have difficulties in being absorbed into the bloodstream for it to work its magic. As curcumin is fat-soluble in order to break down it needs to go through certain stages when taken orally. Perhaps the Balrog in The Lord of the Rings did not pass because of Gandalf. The process for curcumin is tough as well as it has to pass through its own fire of doom. Because Curcumin is fat-soluble it needs to dissolve in fat which will also help its bioavailability, and as the body is mostly comprised of water, it has a difficult time. As the body is mostly comprised of water, it has a difficult time because it is not Water soluble. First, it must pass through the stomach, once that trial is over, what has survived then needs to go through the small intestines passageways when it normally would pass into the bloodstream when it will find it’s home usually in the Liver. However, as it gets into the Lymphatic system it will also be transported within the body where it is needed most, for example, the brain. The Curcumin has difficulty breaking down in order to pass through the cells. A small amount may pass through but this requires ingesting larger amounts of Turmeric for this to happen. That can be a bit dangerous if too much is taken. Those that do not get through will find the exit far quicker via another passageway never to return. You could say it literally gets flushed down the toilet. Fat can be your friend. This does not mean you should forget about taking Turmeric, as there are great ways around this issue in order for the Curcumin to pass easily without a struggle. As already stated Curcumin is fat-soluble, so you need to take it with a bit of fat. Do not worry about weight issues you are not taking large amounts of fats. When you normally have curry foods, the curcumin works well because there is some oil that is used in the cooking process. Here you can add extra Turmeric in the curry to gain that extra boost with the health benefits it has. When added to food the quantity is not an issue as the oil is breaking down this quickly. (More on the healing and health benefits at a bit later). Two of the best oils to use, not just for Turmeric but in other areas is Extra Virgin Olive Oil and Coconut oil. 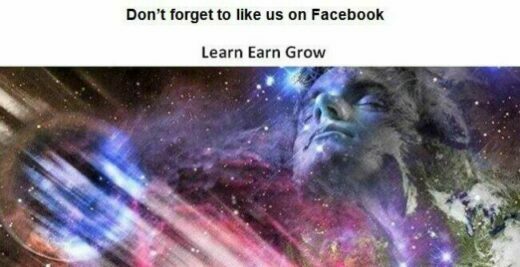 You will find two of the best and most recommended ones below. In using Turmeric, you do not have to live on a Curry diet to get the extra benefits. Here are some extra ideas to get you started, you may even have or come up with ideas of your own. • You could add a bit with some oil or better still, Kirkland Signature Organic Extra Virgin Olive Oil when making a salad or just toss it in some vegetables and have a vegetable snack. • We know that Avocado has fats but they are also good fats and as you sprinkle some Turmeric on the Avocado (If available preferably the Organic type) the fat here will help dissolve the Curcumin and work well in getting this into the bloodstream without the struggle as mention further up in passing through the stages. 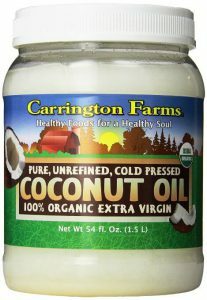 Coconut oil is great for many things, in particular, the organic type as displayed below. You can add a bit of the organic Coconut Oil along with a spoonful of Turmeric and place this into a smoothie or even when juicing vegetables. Remember mixing the Turmeric/Curcumin with Coconut oil allows it to be dissolved even in a smoothie or juice. An even simpler way is to boost the effectiveness of Turmeric and its property Curcumin is to add some Black Pepper. Black Pepper has property within called Piperine and by using this method together with Curcumin. Piperine enhances the Curcumin’s bioavailability, by 2000% rather than using just Curcumin on its own. 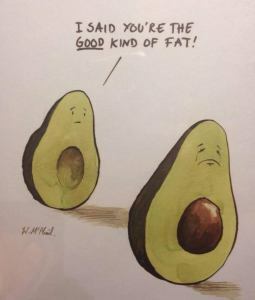 Therefore, when you look at it in this way fats are your friends. The best method of using Turmeric is to add it to your foods and the other methods mentioned above. However, in order to absorb the Curcumin component of Turmeric easily, it may need a touch of extra effort. As we know, in today’s age and society, not everyone is able to find the time to enjoy spending enjoyable moments at home cooking or for some may have difficulty to do so for whatever reason. While others are always in a rush and unfortunately, have difficulty in finding time to relax and enjoy life. Some may not like Curries or Avocadoes, therefore, this may stop the opportunities of getting better health benefits from Turmeric. Just like many people would prefer to have supplements such as vitamins and minerals so too is the availability to have Turmeric in Capsule form. But not just any capsule. 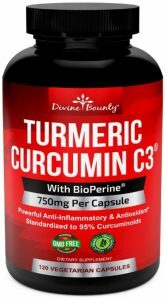 It would be pointless to take Turmeric Capsule that just contains higher doses of Curcumin on it own. What is important in this case is to take the Capsules that have Black Pepper included, as the benefits are in its highest form as described earlier above. With some research, I found a great supplement on Amazon that has both qualities and the greatest benefit for you. This supplement displayed below has gone one better to the others as it is also GMO-Free as well. Here you are able to buy the supplement with the vital combination of both Turmeric/Curcumin along with Black Pepper. Now that we have discussed the importance of how to take Turmeric, let’s now look at some of the other health and healing benefits available for you. Chinese and Indian Ayurvedic Healers have used turmeric, to treat many disorders for centuries. Ancient Egyptian used Turmeric for the same benefits of healing and health. Many conditions were treated such as diarrhea, heartburn, infected wounds along with issues dealing with ringworm when they applied Turmeric to the skin. Modern science is still going through and finding many more benefits of Turmeric and its compound Curcumin, some may need more time other reports have found that turmeric has tremendous benefits as described below. Due to the anti-inflammatory properties, it has been found to have great anti-arthritis effects for many arthritis sufferers. 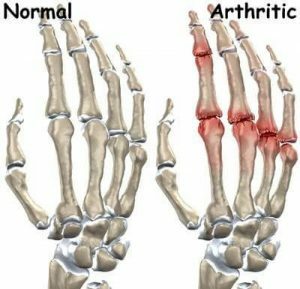 One method that has been suggested that for those who suffer rheumatoid arthritis to perhaps have an anti-arthritis turmeric tea instead of your normal daily coffee. The ingredients are simple which I have added below. Turmeric powder can stain many things when it comes in contact with for example hands, clothing, etc. so do not rush. • Mix a paste of the Turmeric powder with the honey to get that wonderful Yellow-Golden consistency. • Pour hot water into the cup, and stir well to dissolve the turmeric paste into the liquid. • Allow the tea to cool down and drink your anti-arthritis turmeric tea and enjoy. 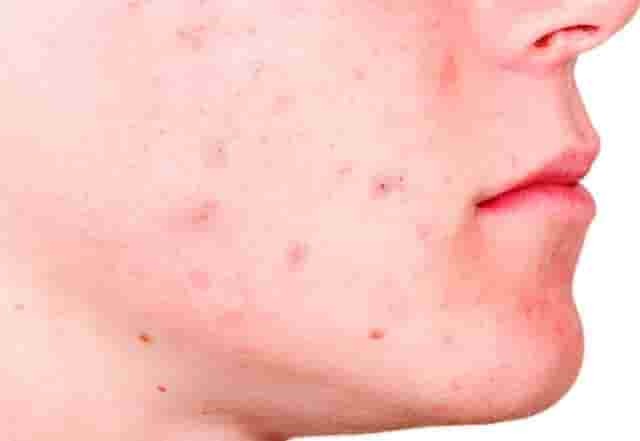 The anti-inflammatory properties within Turmeric help to reduce any redness from blemishes along with disinfecting the skin with the antibacterial properties when working on Acne. 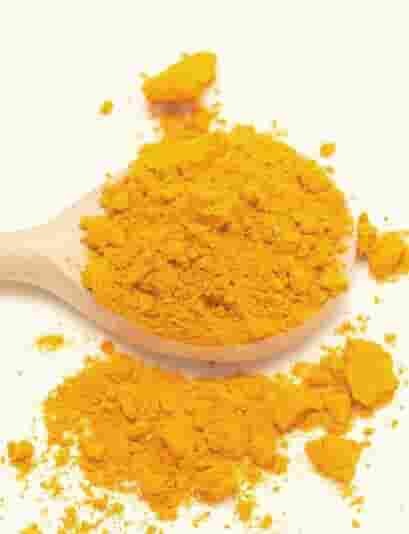 Skin conditions such as Acne and Psoriasis have benefited from the use of Turmeric. As an Antioxidant Turmeric helps to keep free radicals, which may cause premature aging. It works well for those with oily skin. Through regular use, a vast improvement in the quality of your skin may be noticed. Amyloid plaques in the brain help to contribute to Alzheimer’s disease. 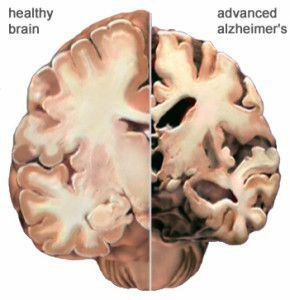 Beta Amyloid is a protein fragment produced normally within the brain. Within a healthy brain, they are usually broken down and eliminated. However, in the case of Alzheimer’s disease rather than be broken down then eliminated they accumulate and form hard insoluble plaques. As these plaques accumulate between nerve cells, it causes a degradation that leads to the symptoms of Alzheimer’s disease. Researchers believe that the antioxidant together with the anti-inflammatory properties of Curcumin is able to break down the plaques. The reason for this belief is that as the blood vessels become less clogged it would allow certain sections of the brain to obtain oxygen much easier thereby allowing better brain functioning. 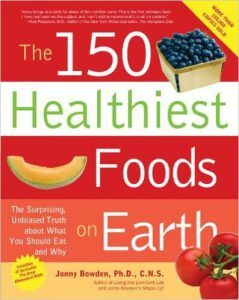 A nutritionist by the name of Jonny Bowden stated in his book The 150 Healthiest Foods On Earth that there are at least 30 odd studies that show curcumin has an anti-tumor effect. I quote “either reducing the number or size of tumors or the percentage of animals who developed them”. A study has also found that when a combination is made with vegetables like broccoli and cauliflower it can treat and help prevent prostate cancer. In Australia, this is the third most common cause of cancer death in men along with being the most common cancer diagnosed as well. About 85% of the cases diagnosed in men were over 65 years however that is not to say it doesn’t happen earlier. In the USA, there are about 240,000 men diagnosed each year with prostate cancer. More vital studies are needed. The benefits of Curcumin have a positive effect on Cholesterol, which may help lower cholesterol and prevent bad cholesterol (LDL) from building up in the blood vessels. Cholesterol, when it builds up in the arteries tends to create a blockage, in turn, this restricts or stops the blood from flowing through the arteries. As the build-up blocks the flow of blood which then creates issues that most likely result in having heart attacks and/or strokes. Trust me been there done that. 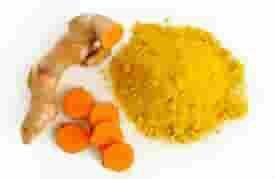 The Curcumin cause weight loss but instead, it helps to stimulate the gallbladder, which then produces bile. The bile helps to digest fat, which in turn again improves the digestion thus helping control weight more effectively. It also helps with the gas and bloating. Turmeric helps to lower blood sugar levels when added to your diet. However, this still needs to be monitored in particular for the diabetics who are on medication or insulin, as you don’t want the blood sugar level to drop too low which then becomes another issue in Hypoglycemia. This can be dangerous. So as you can see there are many benefits yet many more benefits can be given. The best way is to add Turmeric to your diet or normal meals. You can also purchase the roots itself and grate them as you would with ginger, which they are both parts of the same family. For those unable to take the powdered form for whatever reason supplements may be available to you. Rather than searching the link above you can also find it here to save time. Turmeric can act as a blood thinner, it can also help to lower blood levels. Diabetics usually take medication to help lower and maintain their blood sugar levels as there are generally high. Should you been taking medication along with turmeric this could lead to the opposite end of the scale in the form of Hypoglycemia (Low Blood Sugar). If you are taking turmeric supplements to ensure your doctor or surgeon knows about this. They can advise you on the best action to take. You are most likely to be taking some form of blood thinning medications. This is because it helps to regulate the blood flow and work on preventing the blood from clogging amongst other issues such as cholesterol build up. Again beware that Turmeric helps to thin the blood. 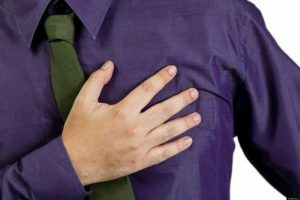 The main issue here is when blood is being thinned by medication due to your heart condition, you are already at risk of bleeding because the blood is being thinned. Many times you may experience bruising when your blood is thin. So be careful on those corner cupboards. The main aspect is if in doubt consult your health professional who is able to make the call. Hope you enjoyed this section on the Health benefits of Turmeric. If you have other methods in the use of Turmeric please feel free to place your comment below.